NCEDSV is participating in the national SAAM campaign through social media awareness initiatives and by promoting statewide resources for sexual assault. Join us in promoting public awareness of sexual assault prevention and response through social media. NCEDSV will post SAAM-specific content via our social media channels throughout April, that you can then share to your pages to help raise community awareness. Add links to your own websites and resources, and share with your audiences. Learn more about SAAM through the National Sexual Violence Resource Center’s (NSVRC) website. Offers free or low cost health care in individuals, including safe services for those that are a part of the undocumented or refugee community. Services are available to those age 12 and older. Services are provided on a sliding scale fee and insurance is accepted. Teens can receive services without parental consent. No one is turned away for inability to pay. Family Planning Clinic Can provide Plan B to victims of sexual violence as walk ins. Will also test for STD/STIs with birth control appointments, but not as walk-in appointments. Sexual Health Clinic Provides testing and treatment for STI/STD’s. Survivors can walk in to receive testing however it is best to call and make an appointment, since the clinic can close if the maximum number of patients waiting is reached. Currently, the wait for an appointment is about a week. If the survivor feels comfortable, they can disclose that they have experienced SV and speak to a nurse and they will try to see the survivor as soon as possible. This community-based organization supports and promotes activities directed at furthering the well-being, positive image, and human rights of the lesbian, gay, bisexual, transgender, and queer community, its allies, and low to moderate income residents in Southern Nevada. This organization is an advocacy network that provides advocacy and community resources for survivors and can assist in completing the victims of crime application. They have free, rapid HIV testing Monday – Thursday. RCC is here for all clients affected by sexual abuse and assault. Their services are provided at no cost to victims. Services include medical accompaniment, general and court advocacy, support group, counseling, and yoga. Performs Sexual Assault Nurse Examinations and can conduct the forensic exam, Jane Doe exam, or the medical-only exam. Cares for any UNLV student, faculty or staff member that has experienced sexual assault, stalking, domestic/dating violence, or is concerned for a friend. The Queer Anti-Violence Project (QAVP) provides Southern Nevada with specific victim/survivor services and anti-violence services directly related to lesbian, gay, bisexual, transgender, queer, intersex, and asexual persons (LGBTQIA). Helps individuals locate health centers in their area. This community agency connects survivors to advocates, emergency shelter and SANE exams in Carson City, Nevada. They provide a wide variety of services to their community such as advocacy, parenting classes, shelter, victim court advocacy, and more. This community agency connects survivors of all ages to advocates, emergency shelter and SANE exams in Reno, Nevada. They provide a wide variety of services to their community such as advocacy and more. Will not pay for STI/pregnancy treatment and testing if a SANE exam is not performed. Help all sexual assault survivors—whether it took place today or 30 years ago. Their sexual assault advocates offer free, confidential support to survivors. Helps survivors and advocates locate Plan B emergency contraceptive in their area, as well as help them afford this over the counter medication with a $10 off coupon. For more National Resources, click here. 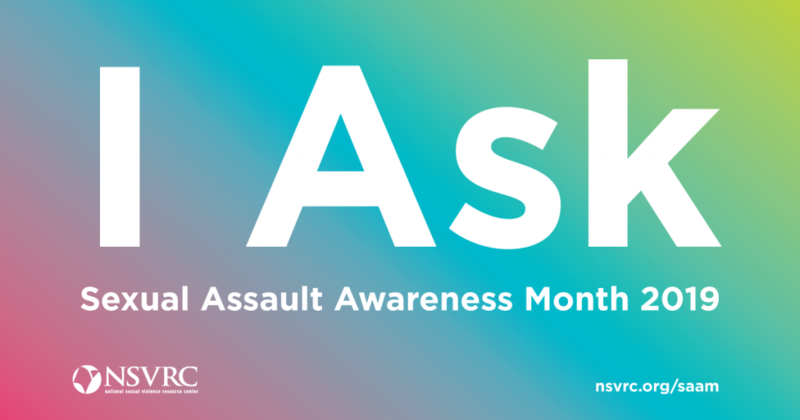 The National Sexual Violence Resource Center’s annual Sexual Assault Awareness Month (SAAM) campaign goal is to raise public awareness about sexual violence and educate communities on how to prevent it. The campaign theme for 2019, I Ask, champions the message that asking for consent is a healthy, normal, and necessary part of everyday interactions. Get their Toolkit to plan your organization’s social media to help spread awareness. Teaching Consent Early in late Childhood and early adolescence. NSVRC offers the Visionary Voice Awards in conjunction with Sexual Assault Awareness Month each April to recognize the creativity and hard work of individuals around the country who have demonstrated outstanding work to end sexual violence. This year, NCEDSV is honoring Clarice Charlie-Hubbard. Learn more about this public event here. Please let us know about your organization’s SAAM events so we can help promote them. send events by email to Communications Coordinator Sara Conrad . To check out more SAAM events in Nevada, visit our calendar.